Multisafe Safety Flags are constructed with heavy duty weather resistant mesh material, and reinforced with stress point stitching. Multisafe flags are offered in red and orange fray resistant jersey knit polyester. Safety flags are made with air channels which streamlines air flow through the flag. Material: Jersey Knit Width: 18" x 18"
Material: Mesh Width: 18" x 18"
18" x 18" Heavy Duty Jersey Mesh Flag is double-stitched with vinyl welting for durability. Stainless steel mounting bracket and spring. Aluminum rod. Kit allows installation at 40° and 90°. Multisafe Mesh Banners are constructed with rhino-tough 9 oz. vinyl coated polyester, which allows air to flow through the banner for less wind resistance. Sewn with UV resistant thread and reinforced with stress point stitching. Top and bottom of mesh banners are finished with durable black edge binding. Multisafe mesh banners are bright yellow and printed with special weather tested jet black lettering. Mesh Banner with Grommets Width: 18" x 84"
Mesh Banner with Grommets Width: 12" x 72"
Mesh Banner with Hooks Width: 18" x 84"
Multisafe Vinyl Banners are constructed with heavy duty 13 oz. vinyl laminated polyester. The vinyl banners are made to withstand wind force, water, oil and salt. They are tear and fray resistant. Multisafe vinyl banners are bright yellow and are printed with special weather tested jet black lettering. Vinyl Banner with Grommets Width: 18" x 84"
Vinyl Banner with Hooks Width: 18" x 84"
Multipren's USA magnets allow for flags and banners, from Multipren's USA's Multisafe product line, to be hung from your trailer without the need of drilling holes or using other complex methods! The high strength magnets are encased in chrome cups and permanently secured within the cup using a high strength epoxy. Multisafe Adjustable Safety Vest is available in 5 sizes (shown below). Fabric is bright yellow 100% polyester mesh with reflective markings. Zipper front closure with 3 pockets. Elastic inserts on each side provide adjustable sizing. Class 2 ANSI/ISEA 107-2004. Multisafe Seat Belt Sleeve is 2” x 18” polyester with 2” silver reflective material giving added visibility while driving a vehicle or operating machinery. Fits standard seat belts. Velcro adjustments. ANSI compliant. Fluorescent Lime Color. Multisafe Safety Glasses are sleek and sporty, lightweight, with all around impact protection. Our safety glasses have a popular design to insure worker compliance. The Multisafe safety glasses are snug and have a comfortable fit to help minimize slippage and provide full brow protection. The lens blocks 99.9% of UV-A light. The hard coated 100% polycarbonate lens feature dual 8" base curvature area for wide, unobstructed vision. Meets or exceeds Ansi Z83.1-2003 compliance standards. Multisafe Safety Helmets are molded from high density polyethylene for maximum protection. The safety helmet features an easy turn knob that allows adjustment without removing the helmet. The no-slip hold maintains the desired fit even in the most physically active jobs or extreme weather conditions. Helmets fit 40 different head sizes, 6 ½-8. The helmet comes with directions, headband and chin strap. Meets ANSI Z89.1-2009, Type 1, Class C, E, & G requirements. White. Multisafe High Visibility Mesh Polyester Vests have 1" vertical reflective stripes. Our high-intensity lightweight, durable fluorescent vests are easily seen day or night for optimum visibility and safety. Multisafe vests have a contrasting black cotton binding around edges, elastic side straps for fitting, and a hook and loop front closure. Conforms to MUTCD standards. Multisafe Safety Triangle Kit includes three highly reflective 17" triangles. When placed along roadside, safety triangles alert oncoming traffic of hazard, emergency, or disabled vehicle. The triangle kit has three visible orange plastic edges with red reflectors on both sides. This self-contained unit needs no power source. The weighted base and no-skid rubber feet keep the triangle in place in high winds. Instructions for use printed on case and triangle. No tools required for set-up. Easy to erect for day or night use. Meets or exceeds DOT requirements. Battery Operated Lights include AC/DC adaptor and DC car charger. 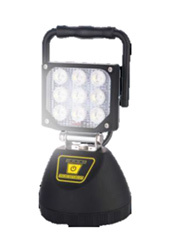 MultiSafe Heavy Duty Work Light Features: 15W rechargeable LED lamp. High intensity 1800 Lumen flood beam. 4 levels of brightness (High, Low, Flashing 1 and Flashing 2). Heavy duty magnetic base. Adjustable handle and lamp head provides the perfect beam angle for your needs. Multisafe Work Light features a high intensity 1000 lumen flood beam with three operating modes (100% intensity, 30% intensity & SOS flashing) and heavy duty magnetic base. Lamp head and handle are adjustable to provide the perfect beam angle for your needs. Powered with a lithium re-chargeable battery. 12V socket charging lead and AC adapter are included. 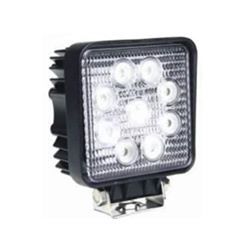 Multisafe Strobe Light Features: 72 High Intensity LED 2nd generation lights with 90# magnetic base. Flashing pattern light. Snap-on base for easy battery replacement. Waterproof Amber lens. Requires 4-AA batteries.